An initial consultation lasts 45 minutes is a face to face or Skype / Zoom session at a reduced fee and all fees are payable up front so your session day and time can be reserved for you. This is to establish how we can work together. If you have any queries regarding this you can contact me directly. Click the image below to book. Alternatively please feel free to simply book in for a full session by clicking below. NB all initial consultations are payable in advance simply to ensure that your day and time is reserved for you and protects us both. As a self employed sole trader with training, experience and various extraneous expenses involved in being an ethical therapist, it is only possible to offer this vital mental health service to our community if fees are honoured. Did you know that training costs in the region of £15,000 over a number of years? Are you aware that associated costs may be in the region of £2,000 annually simply to keep us in business? Many people believe that therapy should be free. Indeed the NHS does provide free therapy but there are long waiting lists, often breaks or cancellations which means your therapy may not be consistent. You will have no knowledge of who will provide the therapy nor the sort of training they have undergone. You may get a very experienced CBT therapist or you may get a trainee. You can be assured I have undergone rigorous training and have extensive experience together with continuing professional development and a good deal of life experience as well. My aim is always to provide a transparent service with continuity of contact and following up as and when required. Therapy is always your choice and whatever your decision I will support you. I am unable now to be able to afford to provide free initial consultations due to the nature of my work but I will always aim to over-deliver to ensure you receive the right support for you. Fees range from £45 – 50 per therapeutic hour, or £180 for a package of four sessions. There is one concession space available for students. 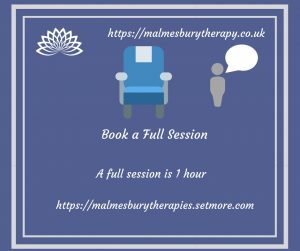 Please note that if you are in NEED of therapy and find the COST prohibits you, please ASK as I am able on occasion to offer a discounted session or two. Also block booking will save on cost. There is always a way forwards!